Let’s be honest, no one is more #FashionGoals these days than Duchess Meghan. From jackets to dresses and even shoes, it seems no matter what, everything the Duchess of Sussex wears turns to gold in seconds. Of course, all of this flattery makes it impossible for any of Us to imitate since everything sells out so quickly. Just about any fashion lover knows that Everlane is one of Duchess Meghan’s favorite brands. We’re even more excited because Everlane just released a brand-new loafer that’s incredibly chic. So why not go ahead and slip into this loafer before Meghan even wears it (and before it sells out!)? After all, it’s the closest most of us will get to the receiving the royal treatment. See it: Grab the Everlane Women’s Day Loafer for $155, available at Everlane! The Everlane Women’s Day Loafer is the sleek style that is rubbing all of us in all of the right ways thanks to its buttery-smooth leather material, of course! Think of this easy-to-wear silhouette as a middleman. It’s where sharpness and sophistication come together, all in one sleek shoe. It’s the epitome of what it means to be simple and subtle yet remain striking. Crafted from buttery-soft Italian leather, this shoe feels as smooth as it looks. The dreamy design just keeps getting better, too! Don’t just dream of walking on Cloud Nine because with this sharp shoe, we can literally feel like walking on a cloud. Designed with a cushioned insole and an elasticized back, this shoe provides endless comfort and support. No matter the season, the reason or even what’s on our schedule, this shoe has our back (or feet, in this case!). Best of all, this shoe exudes elegance and effortlessness all-in-one. Has anyone ever noticed how sometimes a shoe can be too professional or polished and not quite practical enough? It may be the perfect commuter shoe, ready-to-wear option to work or even sleek enough for business meetings, lunches and dinner but it ends there. The shoe cannot transition from work hours to after-hours. It stops there. While it’s functional, it lacks fun. So, of course, we’re just left swooning over this fun and functional shoe. We know, there are so many pros to this super stylish shoe already. Prepare to be amazed, because the endless pros to this sleek silhouette do not stop there. That’s right, it’s the shoe that keeps on giving with five different shades to select from! This sleek style is showcased in black, pale yellow, dark rose, white and even caramel. Each shade is just as stunning as the last but they’re selling out quickly and some even have long wait lists! When having difficulty choosing which shade to select, look for the missing link in a wardrobe. What do we need? Where do we need to wear them? And then work off of that. If looking for the best everyday essential that can be worn to-and-from work, opt for the caramel, black or even white option. It can seamlessly pair and transition from everything from satin trouser pants to high-waisted bell bottoms. The universally-flattering colors will look terrific when paired with crisp white button-ups, cream cashmere sweaters or even solid sleeveless turtlenecks and trench coats. Much to our liking, this everyday essential once again exceeded our expectations since it’s lightweight enough to transition from season-to-season. Think of all the maxi dresses, two-piece coordinate sets and even fun floral rompers this will pair to perfection with! As we said, endless. Let’s go ahead and make it known that maybe this loafer isn’t meant for any of that. Perhaps, for some, this may just be a sweet silhouette to treat our feet to. In that case, not only do we support it, we have shade options! This would be an opportunity to reach for the pale yellow or even dark rose. When paired with cropped denim with raw-edges and white T-shirts, it’s our weekend must-have. If we’re being honest, it doesn’t really matter where this shoe is being worn or what it’s worn with. All that matters? That this shoe is being worn. It goes without saying it’s the absolute sweetest treat. In an effort to keep all spirits high, it’s important to note that when ordering this shoe treat, there may be a bit of a wait. As Everlane notes on the site, some colors and sizes are fast selling out and shipments can potentially be delayed until June. Don’t let that stop you though! Duchess Meghan waited 37 years to be crowned. We can wait a few months to crown our feet! 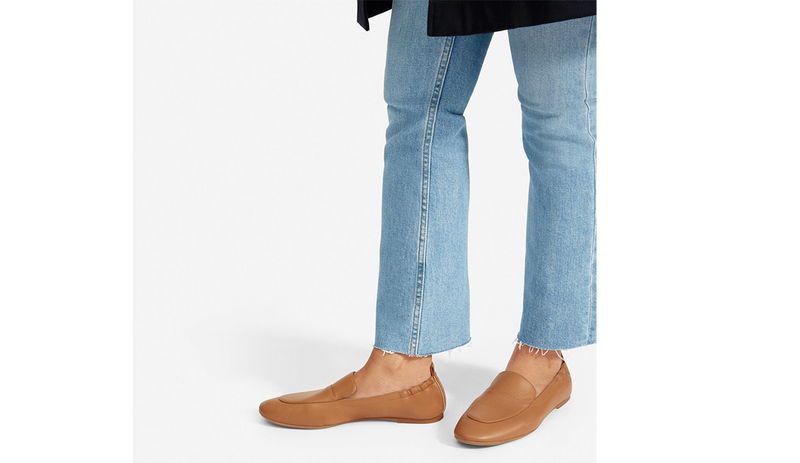 And with good reason, because when it comes to the Everlane Women’s Day Loafer, it’s the sweetest shoe that is worth every second of the wait. Not your style? Check out additional loafer styles and even more shoes at Everlane!